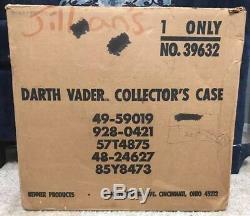 Vintage Kenner Star Wars ESB Darth Vader Carrying Case in Mailer Box - Very Nice. 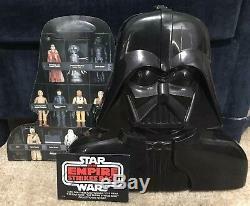 This is a really cool first issue Darth Vader Carrying Case in the original mailer box produced by Kenner in 1980 as part of the Empire Strikes Back toyline. The Vader carrying case is perhaps the most ubiquitous piece in the line, but this one is unique as it is a true first issue. When ordered, the cases arrived in a brown box instead of with the wrap-around "skirt" more commonly seen. These also have a unique 1st issue insert which is included. This particular one also comes with the original pack-in ESB catalog. Name stickers have been very neatly applied. Condition-wise, the box obviously has some major wear. There is writing and some surface tearing as well as remnants of a removed address label. See pics of the sides of the boxes. The top and bottom flaps are all present. There is some tearing along parts of the seams of the top flaps. They still fold nicely, so they display better than their true condition. The actual case is in great shape. Nothing broken, chipped or cracked - figure holding bars all nicely in place with almost perfectly stuck labels. There is some light scuffing (seemingly from being slid in/out of the box), but nothing major. Original insert is in great shape, no bends or tears. Don't miss grabbing this today! I also know that condition can be very subjective, so I encourage you to see pics for exact condition details and ask questions if you need additional information. As always, the item you see is the one you will get. Check my other listings for some great vintage comics and toys. 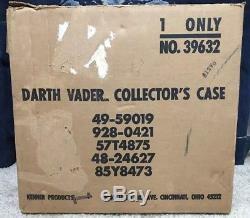 The item "Vintage Kenner Star Wars ESB Darth Vader Carrying Case in Mailer Box Very Nice" is in sale since Friday, December 28, 2018. This item is in the category "Toys & Hobbies\Action Figures\TV, Movie & Video Games". The seller is "borninthe80stoys" and is located in Oklahoma City, Oklahoma. This item can be shipped to United States, Canada, United Kingdom, Denmark, Romania, Slovakia, Bulgaria, Czech republic, Finland, Hungary, Latvia, Lithuania, Malta, Estonia, Australia, Greece, Portugal, Cyprus, Slovenia, Japan, Sweden, South Korea, Indonesia, Taiwan, Thailand, Belgium, France, Hong Kong, Ireland, Netherlands, Poland, Spain, Italy, Germany, Austria, Bahamas, Israel, Mexico, New Zealand, Philippines, Singapore, Switzerland, Norway, Saudi arabia, Ukraine, United arab emirates, Qatar, Kuwait, Bahrain, Croatia, Malaysia, Chile, Colombia, Costa rica, Panama, Trinidad and tobago, Guatemala, Honduras, Jamaica, Antigua and barbuda, Aruba, Belize, Dominica, Grenada, Saint kitts and nevis, Saint lucia, Montserrat, Turks and caicos islands, Barbados, Bangladesh, Bermuda, Brunei darussalam, Bolivia, Egypt, French guiana, Guernsey, Gibraltar, Guadeloupe, Iceland, Jersey, Jordan, Cambodia, Cayman islands, Liechtenstein, Sri lanka, Luxembourg, Monaco, Macao, Martinique, Maldives, Nicaragua, Oman, Pakistan, Paraguay, Reunion, Dominican republic, El salvador.